Hey guys! 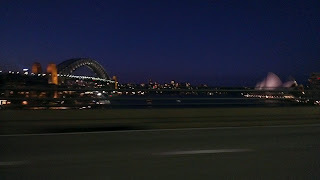 These past few days I have been away at Sydney! I haven't been able to catch up with the latest Android news and such so I have been providing some pre-made posts for you guys to enjoy whilst I'm gone. I will be back tomorrow with the latest updates so don't worry! We are still here! Anyhow, check out this photo I took tonight whilst travelling around Sydney. It's the Harbour Bridge with the Opera House in the background. Hey look! It's the Sydney Harbour Bridge! It’s been revealed that ONE OK ROCK will be providing their song, “the same as…“, for the upcoming movie, ‘GOOD MORNING EVERYONE!‘. ‘GOOD MORNING EVERYONE!’ portrays the bond of a complicated family, and it’s scheduled to open in theaters on December 15th. Besides Aso Kumiko and Oizumi Yo as the lead roles, the movie stars Takemura Akira (SNAIL RAMP), MAH (SHAKALABBITS), and Tsuchiya Anna.